Many of the highest-paying jobs require advanced skills in science, technology, engineering and math. To prepare students for careers in these fields, high schools, colleges and universities across Idaho tapped into a U.S. Department of Labor Grow Green grant managed by the Idaho Department of Labor. The schools were awarded $4.6 million between February 2010 and June 2013 for programs such as wind energy, diesel engine technology, construction and pre-engineering. Nearly 1,800 students were involved in these programs, learning new skills because of the grants. “These are the kinds of opportunities that help this next generation of workers identify rewarding — and meaningful — careers that not only can provide them the ability to enjoy the quality of life Idaho has to offer but also benefit our state and society overall,” said Idaho Department of Labor Deputy Director Sue Simmons, who oversees workforce development. 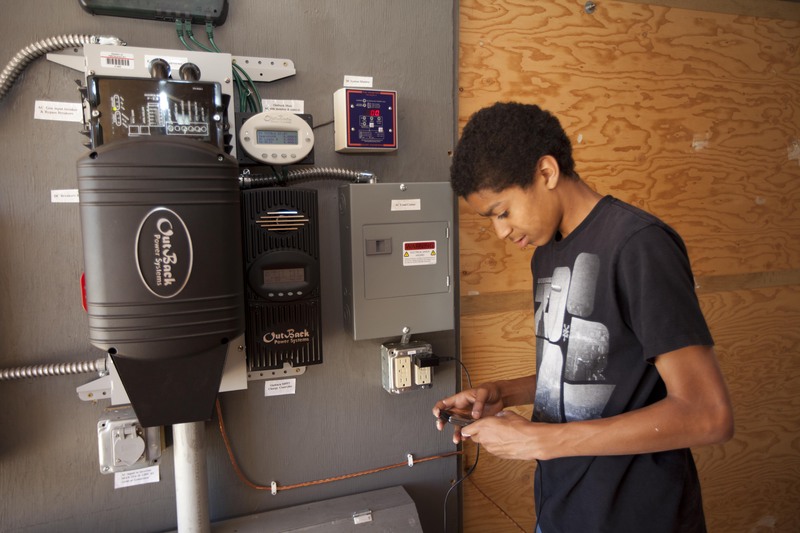 Canyon Ridge High School student Elijah Nicholson uses the calculator on his phone to make calculations to determine the amount of power generated by the solar panels over a specific time period. Canyon Ridge High School in Twin Falls used its grant for a Fundamentals of Technology class that introduced students to all aspects of engineering. Students found out how technology and engineering affect society and the environment, teacher Jim Siggaard said, and they learned about computer-aided drafting and design, robotics and programming, solar and wind energy and electronics. 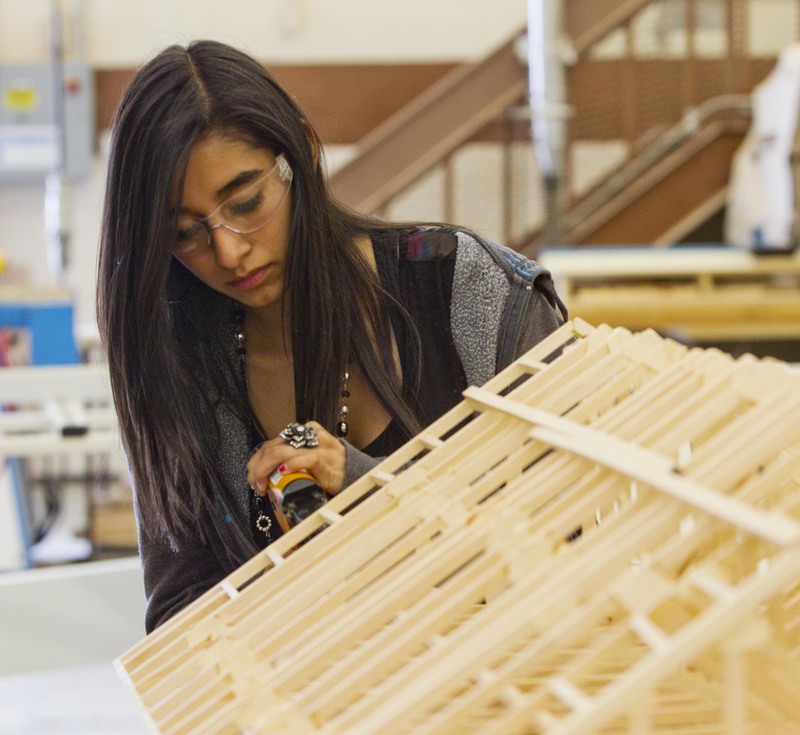 Minico High School students built models as wells as garages and shops. Adrianna Guzman works on her model. At Minico High School in Rupert, teacher Shannon Brown’s residential construction class builds a building during the year from estimating materials and costs to securing building permits for the finished product. “With the Green Grant we added in alternative energy options and energy audits,” Shannon said. North Idaho College in Coeur d’Alene purchased a diesel truck with its grant so students could learn about the new diesel emissions. The students also were able to learn about air conditioning, cooling systems and Freon leak detection along with recovery and recycling. And they could become mobile air conditioning certified with the U.S. Environmental Protection Agency on recovery and recycling. Schools receiving grants were Canyon Ridge and Twin Falls High School, Capitol High School and Dennis PTEC, Carey High School, Columbia High School in Nampa, COSSA in Wilder, Idaho City High School, Kamiah High School, Minico High School in Rupert, Meridian Technical High School, Pocatello High School, Renaissance High School in Meridian, KTEC Academy in Rathdrum, Skyline High School in Idaho Falls, the College of Southern Idaho in Twin Falls, Idaho State University in Pocatello, North Idaho College in Coeur d’Alene, College of Western Idaho in Nampa, Lewis Clark State College in Lewiston and Eastern Idaho Technical College in Idaho Falls. This entry was posted in Students and tagged energy, green jobs, Grow Green Grant, idaho department of labor, students, U.S. Department of Labor on September 12, 2013 by Idaho Department of Labor.